Rough Country Forged Front Adjustable Track Bar (Nearly double the size of the stock track bar) – Makes driving the Jeep with 35s very easy. Jeep has 88K on it right now, I drive it on the weekends; not my daily driver. Overall, no mechanical issues, I can drive my JKU cross country with AC or heater blasting with no doubts or concerns. The Jeep drives extremely well with new parts. 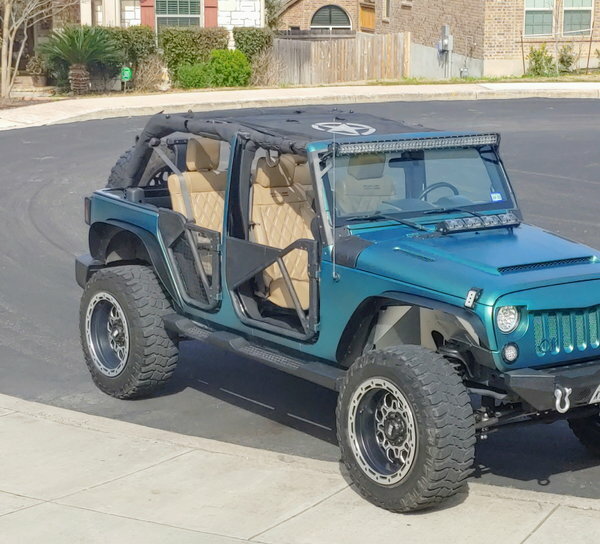 Bottom line, the only reason I am selling my JKU is to complete a project. The autoplex paint does have some pealing. I have a six page Carfax report that will come with the Jeep, clean history. I have a clean blue TX title in hand. Have (but not yet installed) Four Pyle driver 10 inch sub-speakers that mount to the rear roll bar. The speakers are intended to be blasted at the beach or while hosting an off trail hang out. May trade, depending on what you got.